A Hawaii-based company, Sopogy Inc., recently deployed what is said to be the world's first Micro-Concentrating Solar Power (MicroCSP) solar thermal plant at the Natural Energy Laboratory of Hawaii. The system offers an affordable power generation cycle with thermal energy storage. In the early 1990s, Darren Kimura was just another guy starting up his first company. Boeing find ways to make their buildings energy efficient. Their work included installing everything-efficient lighting, fuel cells, Ice Storage Air Conditioning (ISAC), and some of the first photovoltaic solar panels. Working directly with customers and hearing their needs, Kimura created Sopogy Inc. in 2002 to develop a whole new approach to solar called MicroCSP (Micro-Concentrating Solar Power). Kimura's goal was to manufacture smaller, lightweight parabolic trough collectors-the most widely deployed and bankable CSP technology. His MicroCSP collectors follow the sun during the day, using mirrors and optics to concentrate and intensify sunlight. Energy is focused on receivers that are filled with a liquid that increases in temperature while running through a series of MicroCSP units. This process creates mid-temperature thermal heat to be used any time of the day or night. At the start, Kimura knew he had a good idea and put up his own money to develop the technology, which took five years. Today the MicroCSP solar panels have been commercialized and boast 20 to 40 percent efficiency-much higher than the average 15 percent from crystalline photovoltaic modules. In addition, the scalable and modular MicroCSP solar-power collectors are being used for power production, process heat, air conditioning, desalination, and other applications. This past December, Sopogy proudly helped inaugurate the world's first MicroCSP Solar Thermal Plant at the Natural Energy Laboratory of Hawaii. The 2 Megawatt thermal energy project spans 3.8 acres in the Kona desert and utilizes 1,000 Sopogy proprietary MicroCSP solar panels. "This is actually our ninth project," says Kimura. "The previous eight projects were smaller, but each has grown progressively larger to the point that we could build and gain investor confidence to have a utility-scale electricity generating project." Efficiency runs through every aspect of Sopogy's technology, including the initial manufacturing. For example, new solar technology normally requires the development of new machines to fabricate (also known as fabs), which can easily cost $10 million to $15 million. For a start-up company like Sopogy, it would take time to find investors to raise that kind of money. So, Sopogy simply redesigned the manufacturing process. 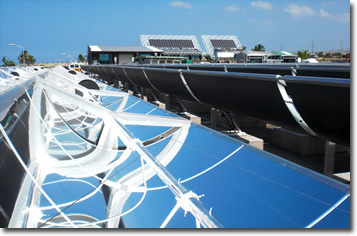 On the Hawaii solar project, MicroCSP collectors use mirrors and optics to concentrate and intensify sunlight. Energy is focused on receivers that are filled with a liquid that increases in temperature while running through a series of MicroCSP units. "Rather than build new fabs, buy a building, hire and manage the labor, and take on all the risk that comes with it, we simply looked at existing equipment out there," says Kimura. "What we found were machines that make light fixtures and car parts. So we designed our collector to be made by that type of equipment. It gave us the ability to basically hop over the whole fabrication issue.We also didn't need as much capital, because we didn't need to build the fab." Also, by using existing machinery, Sopogy can manufacture its technology anywhere, further lowering the cost. "We can go into any country and find a manufacturing plant ready to go right now," says Kimura. "Today there are a lot of car manufacturing plants that have been shut down. We go in, retrofit the machines, and quickly begin manufacturing our products. This keeps manufacturing in country and reduces shipping and handling, customs, and freight." 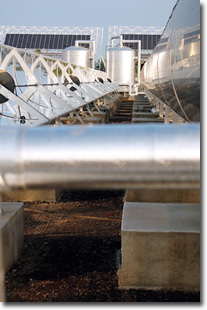 Sopogy took the same practical approach to installation as it did to manufacturing. "We wanted to create a system that was so easy to install that you could get a local contractor to put it together," says Kimura. "Our goal, again, was to use what's available and what's affordable. In this case, we designed the rest of the system from the parts plumbers and HVAC technicians have in their truck, and from skills they have today." The technology also uses affordable material. The panels are smaller, and the collectors are made from recyclable aluminum. "This means there's not a lot of waste in the lifecycle of the product," says Kimura. "In addition, the technology is able to be repaired part-by-part, thus extending the systems' expected lifetime. An example is your car. If you have a flat tire, you replace the tire. You don't throw the car away." The storage feature is also efficient and allows for storing, shifting, and firming energy generated to be produced during cloudy periods. "There are a lot of ways to store energy," says Kimura. "The solution we came up with is very cost effective. We store hot oil in containers. To oversimplify it a little bit, what we do is similar to using an insulated cup to transport your coffee from home to work in the morning." As expected, Sopogy is getting a huge response from utilities affected by clouds and heavy storms asking if this feature will work for them. There are unique challenges in bringing new technology to the market. The first is that, since no one has done it before, there is no model to follow. "There's no precedent in Micro-CSP, so we had to create the rules," says Kimura. "That's not easy because it requires changing the way people think. Being persistent. Being convincing. Being responsive. Having more data. Showing the system working and building confidence along the way. You are paving the future, and that requires patience." 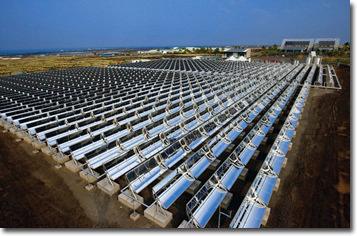 The 2 MW solar thermal plant at the Natural Energy Laboratory of Hawaii spans 3.8 acres in the Kona desert and utilizes 1,000 Sopogy proprietary MicroCSP solar panels. Another challenge is the amount of necessary testing and verification. "Continuous testing and continuous buy-in from industry experts is vital," says Kimura. "At this point, we have produced tons of extensive data for engineers-but when you're in the process of developing new technology, people just don't know what to ask so they ask for everything." Currently, the ideal customer for Sopogy's technology is a utility looking for power projects under 50 MW, as well as companies interested in solar air conditioning. Sopogy also offers desalination and has the capacity of approximately several hundred thousand gallons a day. "We're going to be pushing all of those numbers up," says Kimura. "We're trying to make it a bigger power solution-more water, more air conditioning. We need to bring these solar solutions to the world." At the same time, Sopogy is trying to push the costs down. "In most markets, we're at the same installed price as other solar options, but where we win is that our technology generates more energy," says Kimura. "At the same price, you get significantly more efficiency. And that translates into a faster rate of return or payback." He adds that costs will be continually pushed lower as Sopogy increases production. "That's where we're focused. By reducing our costs, we can bring our technology to more customers." Overall, Kimura is amazed at how far solar has come as an industry and proud that Sopogy has played a part in changing the business model. "I think Sopogy is changing the way people are thinking about concentrating solar," says Kimura. "We're bringing the technology to brand new markets that people said concentrating solar couldn't address. One example is rooftops where people have historically said CSP was too heavy and high temperature to operate. We now have multiple locations where MicroCSP has been installed on the rooftop, replacing PV as an option. "I think by changing the rules of the game, we enable not only our own company and our technology, but we enable our customers to get faster energy savings to help their bottom lines through reducing their energy, and that's what matters the most to us." Kimura also sees a solar "explosion" on the horizon. Although solar today is less than one percent of the total energy marketplace, he sees real potential in the future. "There could be the equivalent of $500 billion a year of electricity generation through solar," says Kimura. "I think solar can also reduce natural gas and the amount of coal being burned as well. You're going to see the solar industry grow fast, becoming equivalent to the next Internet boom." But without the bust. "If you think back to the late 1990s and early 2000s, the Internet was growing quickly. Companies that are providing services today-like Google-were ideas in the early 1990s. And as the Internet developed, consumers adopted new technologies spurring this massive growth of new companies coming out of nowhere to fill the need." The same thing is happening in solar right now, he says. "People are recognizing the need, infrastructure is improving, and companies like Sopogy are bringing new technologies and new business models to the world. "I predict in the next 10 years, you'll see solar make up 25 percent of our energy portfolio, which is amazing."